Posh star Marcus Maddison celebrates the only goal of the game at Doncaster. Photo: Joe Dent/theposh.com. 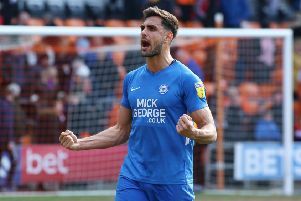 Peterborough United kept their League One play-off hopes alive with a thoroughly deserved 1-0 win at Blackpool today (April 13). That’s three wins and three clean sheets in a row for Posh. Marcus Maddison claimed the only goal of the game just before the break to make it three goals in three games for the mercurial winger. Lee Tomlin of Peterborough United in action against Blackpool. Photo: Joe Dent/theposh.com. It was a battle throughout on a terrible playing surface, but Posh defended so well, goalkeeper Aaron Chapman enjoyed a quiet afternoon. Posh remain five points behind sixth-placed Doncaster, but have a game in hand. Donny beat Plymouth 2-0 today. 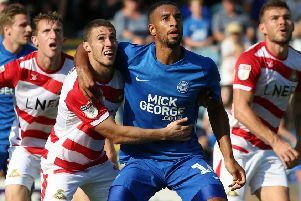 Posh named an unchanged side as manager Darren Ferguson resisted the temptation to recall Matt Godden in place of out-of-form striker Ivan Toney. Toney’s muscular presence on a surface not suited to ball-players was probably behind Ferguson’s thinking and the big man battled gamely in a stop-start, error-strewn half. Posh always looked the more accomplished side in that period though and they delivered a gem of a goal in the 43rd minute as the two most naturally gifted players in the squad combined. Lee Tomlin, who saw a goalbound shot charged down in the first minute, provided the assist with a neat through ball which found Maddison galloping into the Blackpool penalty area. Maddison’s strike at goal was pure and found the roof of the net. A few minutes earlier Toney had rattled the top of the crossbar with a fine volley after one of a handful of fine forward passes delivered by centre-back Ryan Tafazolli. Tafazolli also performed his main duties well with Blackpool threatening only once when giant forward Armand Gnanduillet beat Chapman to a left-wing cross only to see his header bounce the wrong side of the post. Nathan Delfouneso scooped Pool’s other scoring opportunity over the crossbar after the home side again caused problems down their left hand side. Posh started the second-half on top with Siriki Dembele and Toney excahanging passes before the ball ran away from the former. Maddison’s chip then found Toney, but he struck his volley into the ground and it was saved easily. Posh were so dominant Pool made two substitutes and switched to wing-backs before the hour mark. It almost worked for them immediately as Pool got in down the right hand side. The ball was cut back to Nya Kirby, but his shot was blocked by Rhys Bennett. Posh still enjoyed lots of possession with Toney and Tomlin seeing shots charged down, but Jason Naismith, who enjoyed a terrific game, had to defend well to stop Gnanduillet reaching a right-wing cross on the six yard line. Posh took off Tomlin and Dembele and seemed to settle for 1-0 until Toney fed Maddison who fired just over from 20 yards seven minutes from time. Pool employed the long ball more as the game wore on, but Posh still looked the most likely to score. Toney intercepted a backpass, but home ‘keeper Crisoffer Mafoumbi saved. Cooper, Toney and Maddison then combined but Mafoumbi saved the latter’s shot. Maddison didn’t care. He was the matchwinner again as Posh continued to put pressure on Grant McCann’s Doncaster.